Undefeated three-division world champion Mikey Garcia and unbeaten IBF Junior Welterweight World Champion Sergey Lipinets went face-to-face for the first time Monday at a press conference in Los Angeles to discuss their main event showdown on Saturday, Feb. 10 live on SHOWTIME (10:15 p.m. ET/PT). The matchup of top-5 ranked junior welterweights will take place at the Alamodome in San Antonio, Texas and is presented by Premier Boxing Champions. SHOWTIME CHAMPIONSHIP BOXING coverage will also feature two-division world champion Rances Barthelemy in a rematch against Kiryl Relikh for the vacant WBA 140-pound world title. Tickets for the event, which is promoted by Ringstar Sports and TGB Promotions, are priced at $250, $150, $75, $50 and $20. Tickets will go on sale tomorrow at 12 p.m. CT and will be available at Ticketmaster.com. Lipinets will be making the first defense of his world title while Garcia looks to become only the third fighter in modern history to become a champion at 126, 130, 135 and 140-pounds, joining future Hall of Famers Juan Manuel Marquez and Manny Pacquiao*. “A world champion like Sergey Lipinets is more exciting an opponent for me than an easy title defense. I wanted a challenge and this man presents that. He’s a bigger man naturally. He’s going to be very hungry and motivated. He knows a victory over me launches his career to the top. That’s going to make this an interesting fight. “To win a world title in a fourth division is a big deal to me. My dad always wanted a three-division world champion, and now I have a chance to give him a fourth title. That’s something that really excites me. “It’s been a great return to boxing since my layoff. When I came back, I wanted to move fast and take on big challenges. That’s what we’ve been doing so far. I want to take on any challenges that people think I can’t achieve. I think slowly we’re proving to everyone that I’m better than ever and I’m going to keep taking on the kinds of fights that will cement my legacy. “It would be a great accomplishment to be in the discussion with guys like Manny Pacquiao and Juan Manuel Marquez, that would be a win in itself. But it wasn’t on my mind when taking this fight. I just want to keep fighting the best out there. There’s still more for me to accomplish until I’m on the same level as Pacquiao and Marquez. “It’s going to be a great fight. Like I’ve said, the challenge for me is that I’ll be fighting the bigger man. On fight night, that advantage he has on me might be enough to make it that much more exciting. It will be interesting to see how well I adapt to the size. I have to make adjustments to overcome those challenges. This should give the fans the excitement that we want to give them. “My only focus is on February 10 against Sergey Lipinets. That’s my target throughout the entire camp. There may be more opportunities for me on the horizon, but you’ll see on fight night that I’m one hundred percent focused. “Mikey Garcia is a great champion and I want to be in the position that he’s reached in this sport. The only way there is to go through him. “I’m taking on a great challenge against Mikey Garcia, and many people think I’m not ready. This is the fight that I wanted. I’ve had many obstacles in my way throughout my career and I’ve overcome them all. I’m going to overcome Mikey Garcia just like that. “Every time I have sparred with top fighters, like Terrence Crawford, I have learned more about what I need to improve to get to the next level in this sport. That kind of experience has helped my confidence increase and will help me when I face Mikey Garcia. “A lot of things can happen when you move up in weight. Usually people use some pop. Whatever version of Mikey Garcia shows up; I’ll be ready for him. “I believe I’m going to win, Mikey believes he’s going to win, and it will all unveil in the ring. One thing I can guarantee; it’s going to be a great fight. “Every fight I’ve had has been against a tough opponent who has helped get me to this point. Now, I’m ready to fight the best, and Mikey Garcia is truly that. “We know that Sergey Lipinets is a very dangerous fighter. He’s a really strong champion. I know he’s going to be hungry because he wants to become a big name by beating Mikey. “Mikey is very smart in the ring. We’re going to come in there with a good game plan. We’ll have some big sparring partners. Strong, heavy guys who will give Mikey a big challenge in sparring. “We will be prepared for any and every thing. This way, when fight night comes, we’ll have an answer for everything. The key is that we just have to be on point from the opening bell to the end. There’s no way around it. “We’re going to cover everything in training camp. You have to have every option available to you on fight night. This way, you’re never surprised in the ring. Sergey won’t go in there swinging to get a knockout, he’s going to be disciplined and focus on getting the victory. “This is going to be a huge night for the 140-pound division. It will be another toe-to-toe showdown at the Alamodome in San Antonio, where so many great matchups have taken place before. Tickets start at just $20 so we expect another great crowd of fight fans down in Texas. “This matchup features two undefeated fighters, two big punchers and 50 wins, 40 by knockout, between the two of them. These guys are both champions who are daring to be great. These are exactly the kind of fighters that the public likes. These fighters will push themselves to be great. “These guys only know one thing, and that is winning. Sergey Lipinets is the biggest puncher at 140-pounds and it seems like Mikey Garcia always seeks out these big punchers. “What boxing needs are great fights. Good, high quality matchups like Leo Santa Cruz vs. Carl Frampton, Keith Thurman vs. Danny Garcia and Errol Spence vs. Kell Brook. There needs consistently be good fights, and that’s what we have been doing at SHOWTIME for the last couple of years. No other network has done the quality of fights that SHOWTIME is doing. No other network is as committed to the sport as SHOWTIME has been. 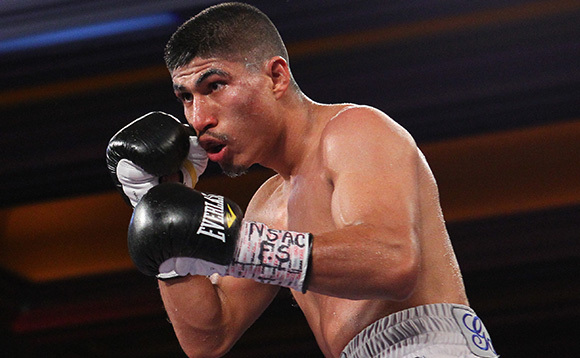 “The best need to fight the best, and that is what Mikey Garcia has done. He came off of a two-and-a-half-year layoff and in 18 months he’s had four fights, two title fights and will be going for a title in a fourth weight class, something only Manny Pacquiao and Juan Manuel Marquez have done before. That’s what great fighters do. “Historically the fighters who separate themselves as legendary, are the ones who challenge themselves and travel across weight classes to seek these challenges. But there are two sides to this story. Those who have been paying attention have seen Sergey Lipinets make a lot of noise on SHOWTIME cards lately. He has risen very quickly.